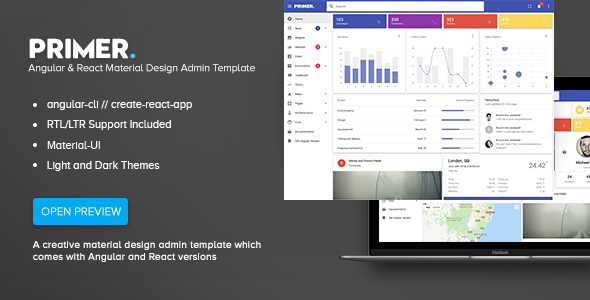 Primer is a creative material design admin template. It comes packaged with an Angular version and a React version with RTL support and light and dark colour schemes. With this, you get all you need to start working on your SAAS, CRM, CMS or dashboard based project. Git repo now available. To gain access simply get in touch via the profile page with your github username/email address. Refactored accordion directives to use attributes instead of css selectors. Files affected are admin/admin-layout.component.html and apps/mail/mail.component.html . This update contains a number of breaking changes. The best way to update is to check your files against the commit log and make the necessary changes on your project files. If you don't have github access then get in touch via the themeforest profile page. Also refer to https://github.com/angular/angular-cli/blob/master/CHANGELOG.md and https://github.com/angular/material2/blob/master/CHANGELOG.md for further information. Updating: Update your package.json and src/polyfills.ts files with the one from the update and then update your npm packages. Updating: Only scss changes in this update so you can go ahead and replace your assets/scss/ folder with the updated one.